What's a Realistic Goal for My Next Half Marathon? I started running three months ago and followed a beginner marathon training schedule that had me running between 12-20 miles a week and running 4 days a week with a long run on the weekend. I just finished my first half marathon last weekend and was really happy with my results (pace 10:51). I am thinking of signing up for another half marathon in three months time and then another one in six months time and wanted to know what would be a realistic goal for me to shoot for in my next race. Is shooting for 10:00 / miles too aggressive or would 10:30 be more realistic? 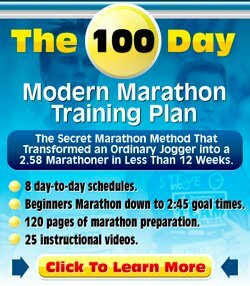 I am planning on following a schedule similar to what I did to train for my first 1/2 marathon except I was going to push myself to run at a faster pace when training. 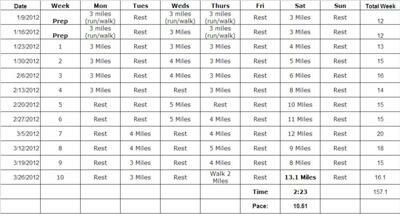 So my schedule for the next race will be running 4 days a week with miles ranging from 12 to 24 miles. Thoughts? Oh, and a very clever way of providing your full training schedule to me via that image! First of all, congratulations on completing your first half marathon. Well done on your time and good to see you like the half and are back for more. It's really hard to predict how much you will improve. Rather than shooting for a goal that's too aggressive, or not aggressive enough, I'll offer you some ways you can test yourself so you'll know what your likely time is going to be closer to race day. Running faster at training is not necessarily going to be the answer to a faster half marathon. I'll provide you with some suggestions for your training and then some ideas on how to test yourself. Keep up the easy runs and long runs for at least three out of four runs. base running is very important. The half marathon is run at completely aerobic pace. You will want to train your aerobic system first and foremost. You do this via easy and long runs. Fast runs do more for your anaerobic system. Build up the mileage as you were going to do. With weekly mileage currently already at 20 miles, you'd be able to build it up a bit more than "just" up to 24 miles. Add a mile to one or two out of your four weekly runs, readjust when you feel it's getting too much for you. Check out the increasing mileage safely page for suggestions on how to do this. Make one out of your four weekly runs a tempo running session. Tempo running is the pace you'd be able to do for about an hour, so it's faster than half marathon pace. For someone in their first year of running, I'd really suggest not doing anything faster than tempo running. Tempo running will give you strong legs and will help get you faster. Run a 10k race 2-4 weeks before your half marathon. Then plug in the results into the Race Conversion Calculator to work out what your half marathon time can be. Monitor the pace you run when doing tempo runs. That pace + ~20 seconds / mile is roughly your half marathon pace. Run at what you think your half marathon pace will be + ~20 seconds / mile for 20k (12 miles). If you can do that then chances are that you will be able to hit your half marathon race pace. Do the double-six as suggested on the goal pace page. This is a workout in which you run six miles easy, then six miles at your goal pace. If you can do it, you are likely to be able to run your half marathon at that pace. So, there you have several different ways to work out what pace you'll run your next half marathon. I have had pretty good results with the 10k test (first of the list) and the 20k test (3rd on the list). Use the tests in combination with each other. Results should be reasonably aligned. They do help to give you a reality check. And that's really helpful because there is nothing more painful than running long distance and going out at too quick a pace! When the tank is empty half way it is a helluva long way to the finish line! Keep up the running and good luck with your training.